In the previous post, we have discussed an elementary proof of the sine law. In this post, we derive the cosine law. 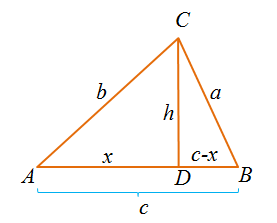 Just like the sine law, the cosine law relates the sides and angles of a triangle. The proof above can be also used to derive the other two equations.